Another duplicate post from my Paintworks blog. This is for last week's Daily Paintworks challenge, "The Paint Some Cloth Challenge"--a good motivator for those of us who like an "assignment." 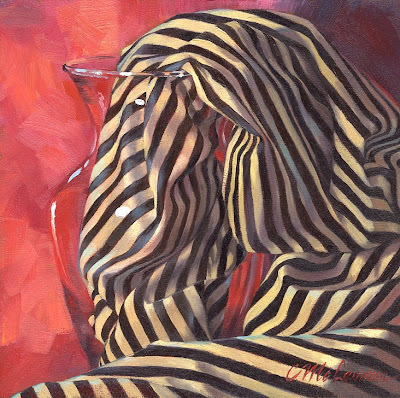 I love the way stripes describe a form, so this challenge was a perfect opportunity to paint my favorite fabric again. I also like how the black and tan stripes seem to take on other colors--probably could push that more in the blacks. Stumbled on your blog from a link at another blog and glad I did. Lovely work! I especially like this latest piece. Those stripes make a very interesting composition and feeling of movement and form.